My life, under the microscope...: bird nerd alert! So I'd just gotten back from the post office this afternoon, parked the car, and happened to catch a glimpse of a mostly-white bird of prey flying high over the pasture. 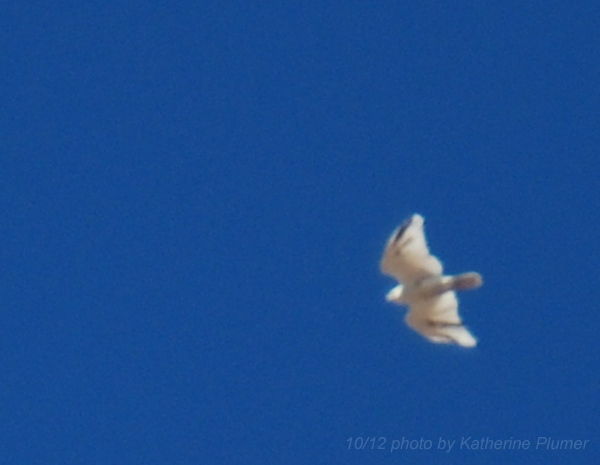 I immediately thought "white tailed kite" but when I actually turned and looked at it, OMG that was no kite. It was big, soaring, and not marked correctly. I got out and stared at it. And stared some more, and was absolutely totally stumped. Nearly white, some dark markings, but no recognizable pattern. Soaring, and at least the size of a red tailed hawk. I'm pretty good at bird ID but this didn't fit any description. Pale ferruginous hawk maybe? But even the back looked nearly white, which didn't seem right... I figured my only hope, lacking any sort of "photographic memory" was to get my camera and try to get a pic. I ran to the barn, had to change lenses, had to change the battery, and by the time I got downstairs again it was nowhere to be seen. Dang it! Oh, but there it was! Waaaaayyyy up there in the sky, just a little white dot. I shot a bunch of photos, most of which are blurry white specks, but even as crappy as they are, it's enough to see random dark feathers, asymmetrical markings, and a lack of any normal ID marks. 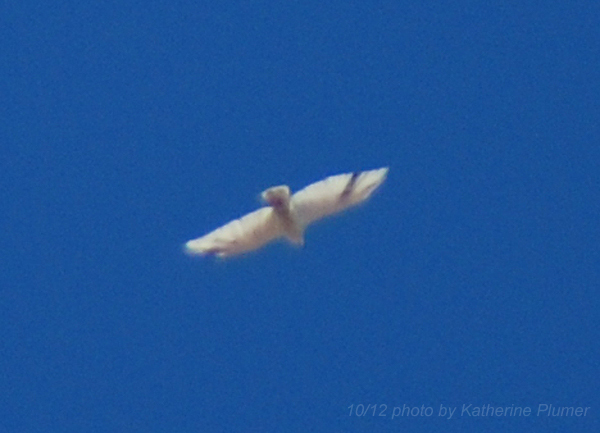 Best guess is that this is a partial-albino red tailed hawk. I sent the pics to a friend whose judgement I trust when it comes to birds of prey. Doing a little more research this evening, I've read that albinism is found in red tails. I really hope to see this bird again, when I happen to have The Beast camera in hand! Whatever it is, it's totally unlike anything I've ever seen. What about a white phase Gyrfalcon? Please let us know what you find out. A Gyr would be a shockingly rare find here, but this isn't one. They would still have uniformly dark tips to the primary flight feathers, not these sporadically placed dark feathers. Body shape and flight behavior matches that of a Red Tail. Leucism and albinism can make some interesting birds to identify but I have to say in all my years of bird watching and rehabilitating, I have never seen a Red-Tail Hawk that complete. Sure hope you get to see it again.